We had a handful of delicious restaurant experiences lately and here's a recap of some of the wonderful meals we hope you get the opportunity to try out! 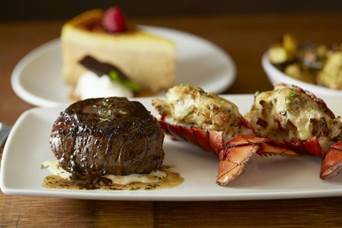 But you don't have to wait to enjoy what Del Frisco's has to offer and you don't even have to be in Chicago, as they have several national locations throughout the country. 'Prime Pair Sundays' is offered where you can enjoy the Prime Pair, Del Frisco's $55 prix fixe menu. A perfectly prepared 8oz filet paired with your choice of succulent crab cake, scallops or shrimp, plus a salad and side for just $55. It all pairs perfectly with interesting company, your favorite wine and an appreciation for the finer meals in life! We look forward to going back and checking out the Restaurant Week promotion soon and even visit on a lazy Sunday for their Prime Pair prix fixe menu too! You can check out other promotions offered at the other 12 local Del Frisco's Steakhouse here. Another restaurant we visited recently for lunch was Ted's Montana Grill. With the New Year, we made it our resolution to eat adventurous. Ted's Montana Grill is our favorite place for bison, which is not just an adventurous, sweet, juicy, tender and delectable meat, but we enjoy the health benefits of the lean, nutritious protein as well. 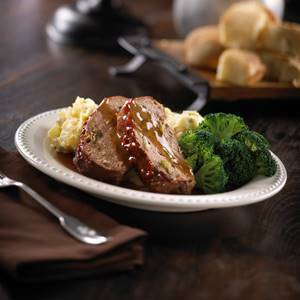 They offer hearty classics prepared with bison to revive authentic American entrees with classic comfort food like Karen’s “Flying-D” Bison Chili, Bison Meatloaf, Bison Pot Roast or a classic burger. Patrick and I had a great experience trying their Bison Meatloaf and their Bison Short Rib. Heavenly! Sunday’s best is Monday’s too! Enjoy a three-course Prime Rib dinner starting at $29.95. Guests choose from a selection of salads before cutting into Fleming’s delicious Prime Rib accompanied with a trio of sauces – au jus, creamy horseradish and dijon. End the meal with a choice of dessert, including an indulgent Chocolate Lava Cake. Enjoy this three-course menu at Fleming’s every Sunday and Monday through February 8th. Enjoy the season with our three-course autumn menu, available through January 31st. Start your meal with a piping hot bowl of Smoked Cheddar & Gruyere Soup that’s infused with the deep flavors of Stella Artois. For the main course, choose from three different options: an 8-ounce Filet Mignon for $54.95, a 12-ounce Filet Mignon for $59.95 or a 14-ounce Bone-In Filet Mignon for $64.95. Entrees are served with a Duo of Harlequin Lobster Tails stuffed with blue crabmeat, as well as a side of Herb Roasted Acorn Squash with a balsamic reduction and toasted hazelnuts. End the evening on a sweet note with a Pumpkin Crème Brûlée Cheesecake that’s drizzled with a decadent caramel sauce and house-made Chantilly crème. Gary Farrell at Russian River Valley is known for some of the best Pinot Noir and has made this wine exclusively for Fleming’s. Available for $70 a bottle or $17.50 a glass, this Sonoma Valley Pinot Noir isn’t even available at the winery. With just 345 cases produced, this Pinot Noir will be sure to go fast. On Mondays, Guests can enjoy a three course meal with their choice of the Craftsman Ribeye, Pork Chop or Sea Bass accompanied by Truffle Mash and Spicy Thai Green Beans. Each entrée comes with their choice of salad – Fleming’s, Bloomsdale Spinach or French Onion – and dessert – Walnut Truffle, Cheesecake or Carrot Cake. To complete the experience, Guests can pick two glasses of wine from a pre-selected menu for $20 or two glasses of wine from a more premium pre-selected menu for $30. Available now for $49.95 each Monday. Guests can savor a mouthwatering Petite Filet prepared with their choice of Fleming’s new steak rubs served with our new Truffle Mashed Potatoes. Each Petite Filet is paired with a Red Wine Flight of three varietals for $39.95. *Available on weekdays in the bar area only. To find a location near you and to make a reservation for any of these promotions and events, please visit www.FlemingsSteakhouse.com.